Gas powered scooters, also known as mopeds, are a fun and efficient way to get around town for those looking for an economical means of transportation. Unfortunately, many people are confused about the laws that govern these vehicles. In this post, we will provide a run down of the laws that govern mopeds in order to clear things up. First, let’s take a look at what Nevada law says a moped is. Many moped owners have found that they can inexpensively increase the speed and power of their vehicle through aftermarket modifications or by simply removing the scooter’s governor. While this extra speed may be welcomed, it is also illegal when your scooter is able to travel more than 30 mph. If you do modify your scooter/moped, you have turned it into a motorcycle which requires all the endorsements, insurance and safety equipment. If you are pulled over by the police, you will be cited for motorcycle violations if your scooter is modified. One of the joys of owning one of these inexpensive vehicles has always been the fact that a moped is not required to be registered. That all changes on January 1st 2017. Starting January 1st 2017, moped owners will be required to register their vehicle. Nevada DMV began accepting moped registrations on November 1st 2016. Unlike motor vehicles and motorcycles that have to be registered every year, a moped only has to be registered one time. The fee for the one time moped registration is $33. This $33 comes with a special license plate to prove your moped is registered. When you sell your moped, you must surrender your plate to the Nevada DMV as these plates do not transfer to new owners nor to new mopeds, if you choose to buy another one. Although laws have changed with regards to registration, you are not required to purchase insurance. Although it is not required, keep in mind that if you are injured, you cause injury or if you cause damage to someone while operating your scooter, you will be on the hook for the damage or injury you cause. While helmets are always a good idea, they are not required by law for drivers or passengers of mopeds. This one may come as a surprise to many but the fact is, a Class C drivers license or higher is required when operating a scooter / moped on Nevada roadways. You do not need a motorcycle license but you do need a minimum of a Class C. This means teens with no license and those with an a instruction permit cannot legally ride a moped on the roadways. Scooter salespersons have been known to tell customers that they do not need a license, so be aware. You are allowed to carry a passenger on your moped as long as your moped is built to carry that passenger. This means your passenger must have a seat and footrests. Also, they must ride behind the driver or astride if your moped happens to be equipped with a sidecar. Your moped must be equipped with fenders to keep from throwing rocks, dirt, water, etc from the rear. We hope this post has been helpful to you and has eliminated some of the confusion (and perpetuating false rumors) about riding a moped in Nevada. Keep in mind that law enforcement does enforce these moped laws. In some cases, there are targeted enforcement campaigns directed solely at mopeds. Keep this in mind and follow the rules! It’s easy to figure out your own most dangerous time to drive–it’s when you make the decision to consume alcohol and get behind the wheel. Needless to say, consuming alcohol and driving puts you at a very high risk of becoming involved in a serious accident or at minimum, behind bars. Common sense tells us that you are more likely to become involved in an automobile accident when there are more cars on the road or when driving in less than optimal driving conditions such as darkness and inclement weather. Things get much worse when the amount of impaired drivers hit the roads, which is common during the holiday season. According to the National Highway Safety Administration, in 2013, there were an average of approximately 27 alcohol-related fatalities per day. But at certain times of the year, those numbers increase significantly. These times include summer and holidays. At Christmas time, those fatality numbers jump to an average of 45 per day and 54 per day over during the New Year’s holiday. To put it simply, it’s not just one’s own intoxication that is dangerous. You can be the most sober person on the road and still fall victim to the actions of others. The video below has graphic language but it shows you just how easily you can become a victim. As you will see, the roads don’t have to be jam packed with traffic. There could be just a few cars on the road which can end in devastation. Whether you have taken online driver’s ed or not, If you’re like most people, you get a little nervous when you see a police car. Almost everyone does. It’s natural. No one likes tickets. This is especially true for new teen drivers. Now imagine that police car is behind you, red and blue lights flashing, demanding that you pull over. Your slightly nervous feeling can turn into pure panic. Your thoughts begin to race with dire predictions of the officer yelling at you, taking you out of the car and taking you to jail. “Did I bring my license? Is my insurance current? Was I speeding?” These are all common thoughts and fears. Almost everyone has the same fears as you do. I am here to give you a game plan on how to think and act when stopped by the police. I know many police officers so I asked them about this. I asked what I, a citizen, should do and think when I get pulled over. What they told me put me completely at ease. I was told that 99.9% of the time, the police are pulling over a car for a minor traffic violation or administrative issue, like expired plates. They do not know who you are. They are not out looking for you. These are usually very short stops and sometimes end in a ticket. I was surprised to find out that, in many cases, police officers will simply give warnings on minor violations. If you have a good driving record, most officers find that simply being stopped is enough of a deterrent. Most of the time, your fears about going to jail and the like are completely in your head. The officer saw a violation and simply needs to talk to you about it. Whether or not you get a ticket depends on a number of factors. 1. Do be courteous when stopped. In fact, be charming. Smile. Greet them. They don’t expect that and it makes their day. 2. Do keep your hands visible and listen to what the officer says. Do exactly what he/she says. 3. Do pull over to the right when you see the lights come on behind you. Driving around after the lights come on makes police officers suspicious. These seem like simple and obvious things, but you would be surprised how many people do not do these things on traffic stops. These people are guaranteed to get a ticket. Police officers have very dangerous jobs. Most police officers get killed or injured on traffic stops. Safety on traffic stops is drilled into them in training. Being confrontational and argumentative does not make them feel safe. It heightens their sense of danger and, lets face it, makes them not like you. You’ll get a ticket. I’m not saying it’s fair, but life isn’t fair. The fair is in August. This post wouldn’t be complete without addressing the fact that there may be nothing you can do to avoid a ticket. Some officers are going to give you a ticket no matter how you act. Some police officers only write tickets and do nothing else. Some never write tickets and loathe doing it. Oftentimes, departments will push citations as a result of citizen complaints about local driving habits. In many cases, there is more going on than meets the eye. Most of your aggravation and fear can be alleviated if you think about traffic stops as outlined above. It’s not personal. They don’t know you. It’s probably a very minor thing and if you treat the officer well, you may just get off with a warning. Even if you don’t, it’s just a piece of paper and you can go to court and fight it if you wish. There is no mystery, but it bears repeating: expect to be treated as you are treating the officer. They are just people and like being treated well, too. In most cases, all things considered, it may get you out of a ticket and alleviate those butterflies you associate with being stopped. Nevada law mandates that teen drivers under the age of 18 must now present a signed DMV form 301 when applying for a driver’s license. 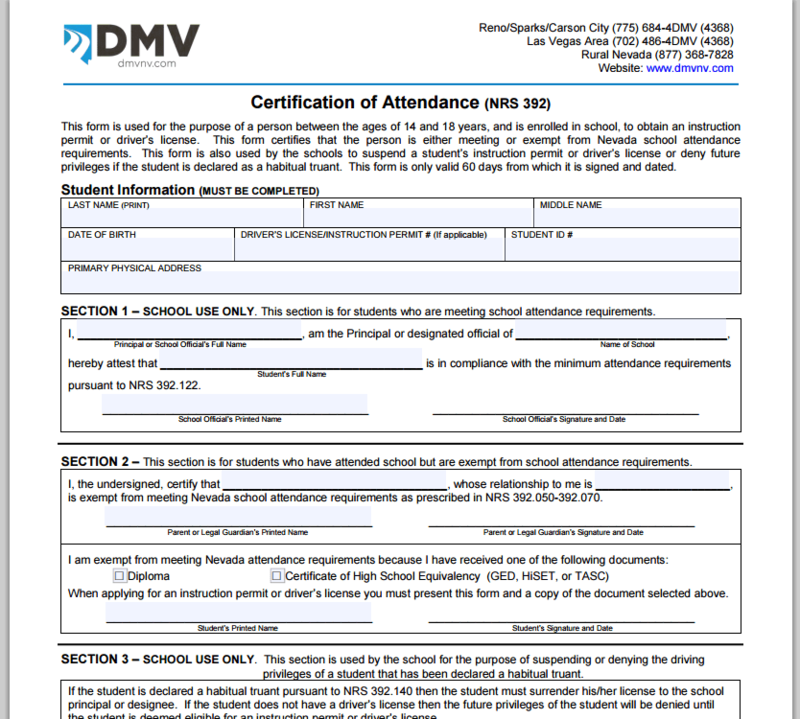 This new form (301) is a certificate signed by a high school official that verifies you meet school attendance requirements. During the summer, when school is out of session, you will have to contact the main CCSD office to handle the research and signing of your certificate. Beginning August 10th, you will need to contact your school directly. You can then make arrangements to get the certificate signed with the appropriate school official. In this post, we will discuss how to prepare for the Nevada driving skills test, also known as the “road test.” This is where the rubber meets the road–literally. This is the final portion of the Nevada driver’s test which, if passed successfully, will earn you the coveted Nevada driver’s license. If you are a Nevada teen driver, by now you should have obtained your Nevada instruction permit, passed your 30-hour driver’s ed course and have spent 50-hours behind the wheel being supervised by your parent or another licensed driver over the age of 21. The night before your driving test, you should be extremely familiar with the vehicle you’re going to be driving during the road test. At minimum, you should spend the night before the test making sure that the car is street legal and without any issues that could prevent you from taking the driver’s test. This typically involves a pre-test inspection. Understand that the Nevada DMV examiner that will be grading you, will conduct their own vehicle inspection prior to you hitting the road. If the vehicle you’re driving is not up to legal standards or is deemed unsafe in any way, you will be sent home without proceeding with the test. To conduct a good pre-test inspection, you should make sure that all the vehicle lights work, including the brake lights, head light, reverse lights, hazards and the turn signals. You should also make sure that the horn works on the vehicle as the DMV examiner will want to see that it is operational. If any of these are not operational, the test will not proceed. You should also make sure that you are familiar with all the buttons, levers and instruments in the vehicle. This includes the AC controls, windshield wipers, turn signals, emergency / parking brake, headlight switch, etc. Not knowing these can not only frustrate you and create a downward spiral, but it also can be the means for an automatic failure. Before arriving to the Nevada DMV for your driving test, you should make sure that your windows and windshield are clean. They should also be free from cracks. It is illegal to drive in Nevada with a cracked windshield, as this is considered an obstruction to your view. A cracked windshield will prevent you from taking the Nevada driver’s test. Cracked, low or excessively worn tires is another reason that the examiner can use for NOT allowing you to take the driving test. Be sure that there is adequate air pressure and tire tread on the vehicle you plan to use. Also, you should ensure that there is no excessive cracking on the outside of the tires, which is a common occurrence in Nevada’s dry climate. Be sure that you know how to adjust the side and rear view mirrors of the vehicle you will be driving. These should be adjusted just before you hit the road on the driving test so that you can show the examiner that you are a safe driver who always adjusts their mirrors before hitting the road. If you fumble around at the last minute, you show the Nevada DMV examiner that you’re not really as prepared for a Nevada license as you want them to believe. Last but certainly not least: make sure you have all your required paperwork ready to go the night before and place it by the front door so you don’t forget it. I can’t tell you how many times our students became so nervous that they showed up for the driving test appointment without the required paperwork. Don’t let this happen to you! Not only will you be extremely embarrassed, you will not be able to proceed with your road test and will likely have to wait weeks before you can come back. 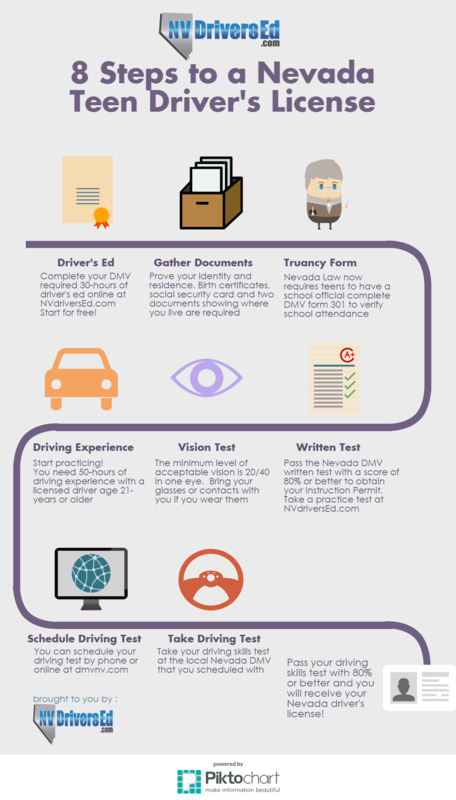 This post will show you how to get a Nevada driver’s license in simple, step-by-step “visual” fashion. This is the best way to follow the sometimes confusing information on the DMV website. If you are ready to start your Nevada driver’s ed requirement, please be sure to visit us at https://nvdriversed.com where you can start for FREE! As you may have heard, the Las Vegas Metropolitan Police Department (Metro) no longer responds to automobile accidents where no one was injured, with few exceptions. According to LVMPD, traffic fatalities have increased dramatically and they need to focus their efforts on traffic enforcement (writing tickets to traffic violators) which, in turn, reduces the amount of traffic accidents and traffic fatalities. NHP, North Las Vegas and Henderson police departments still respond to all automobile accidents that occur on the roadways of their respective jurisdictions. They do not, however, respond to accidents that occur on private property such as shopping centers, restaurants, etc. 2. one of the parties involved is being uncooperative and won’t exchange insurance/driver information, which is required by law. Now that we know who will respond to your traffic accident in Las Vegas and surrounding jurisdictions, let’s take a look at what you should do should you become involved in an automobile accident. 1. Attend to any injuries involved. Call 9-1-1 if someone is injured, making sure that you can give them the location of the emergency. Sometime people call 9-1-1 but don’t have a clue as to where they actually need help. Remember, if emergency personnel can’t get to you, they can’t be of any help. 2. As soon as possible, try to take photos of the scene. This could be beneficial later on should the at-fault driver change their story about who is really at fault in the accident. 3. Move all vehicles out of the roadway as soon as it is safe and practical to do so. 4. Get the names of the driver and passengers as well. Make note of how many people are in the vehicle. There have been many cases where there was only one driver actually in the other vehicle but later, several people filed a claim saying that they were injured in the automobile accident – even when they weren’t involved! 5. By law, you are required to exchange information (insurance and Nevada driver’s license) with anyone that you are involved in a vehicle accident, regardless as to who is at fault. Just because you think you are at fault, you are still entitled to the other driver’s information. To help you gather this information, we have included a handy Nevada Driver Info Exchange sheet (click the link and you can downloaded it instantly). We recommend you print out several of these and place a couple inside each vehicle in your home. These will help you get all the information you will need in the event the police do not respond to your accident. 6. Contact your insurance company as soon as you can to let them know the details of the accident. Remember, you are paying them to act as your agent in the case of an automobile accident. Let them know the details regardless as to whether or not you were at fault. 7. If the other driver was at fault in the accident, be sure to initiate a claim with their insurance company, providing them all the details from your Driver Exchange sheet. Hopefully, you will never be involved in an automobile accident. However, should that time come, it is important to know as much as you can so as to protect yourself. Be sure to prepare yourself by printing out the Nevada driver exchange sheet, compliments of NV Drivers Ed, and keep it in your glove compartment just in case. The Memorial Day weekend – the start of summer – is fast approaching. Unfortunately, summer time is also the deadliest season for teen drivers. And even though we’d rather view summer as those long, lazy days consisting of no school, barbecues, swimming and hanging out with friends, we can’t avoid the glaring statistics of teen driving in the summer months. According to AAA, nearly 800 teen drivers lose their life between Memorial Day and Labor Day. That’s an average of 261 teen deaths each month during the summer – a 26% increase to the average month of the year. So why are their so many teen deaths during the summer months? The answer is pretty straightforward. During the summer, teen drivers are out of school and they tend to spend more time driving. They are also more likely to be carrying teen passengers during this time which would significantly increase the number of teen deaths as more teens are inside the vehicle. And with more teen passengers comes more distraction. In fact, distracted driving is a factor in 58% of all teen automobile accidents. With 58% of teen crashes involving distracted driving, it’s worth mentioning how simply an accident can occur even doing seemingly mundane tasks like changing a radio station, looking at a passenger or simply reaching for something inside the vehicle. Of course one of the biggest culprits these days in distracted driving involves use of the cellphone including texting and talking. Keep in mind that at a speed of 55 mph, a vehicle travels the length of a football field in just 5 seconds! It may be time to revisit your family rules involving your teens and driving. Remember, automobile crashes are the #1 cause of teenage deaths. And as we stated, during the summertime, teen deaths increase exponentially.